I had a gut feeling rotational linear hitting mechanics were a little of both. It didn’t make sense to say it was one or the other. If you find yourself thinking this, then you have an incomplete understanding of dynamic human movement. With today’s access to quality information, experts, and sophisticated technology, there’s ZERO room for ‘willfully ignorant’ hitting theories. Us coaches MUST hold ourselves to a better teaching standard. Standards that go beyond hitting absolutes, which aren’t wrong – but incomplete. We MUST apply human movement principles, that are validated by science, to hitting a ball. Think of these principles as bumpers at a bowling alley keeping the ball from plopping into the gutter. What path the bowling ball takes between the bumpers doesn’t matter, just as long as it stays between them. Hitting absolutes are what goes on between the bumpers. Human movement principles first. And how they’re applied (think video analysis) comes second. Many of you will see this ‘chin to chest’ image and won’t find anything wrong with it, “he’s keeping his head down at impact,” you’ll say. I’m afraid Cutch is succeeding despite this ineffective mechanic, NOT because of it. See WHY breaking the ‘One-Joint Rule’ bleeds force at impact by CLICKING HERE. Again, Bryce Harper is succeeding despite this ineffective mechanic, NOT because of it. In the corrective fitness world, we say ‘shoulders are ear poison’ to maximizing force and reducing the probability of injury. So, what did I mean in the sub-title above “…and Then Some”? That I’ll answer under the Centripetal v. Centrifugal Forces subtitle below. Conservation of Angular Momentum (turning). Like golf, you see his pelvis slide forward before he starts turning. This is a linear move, and I call it shifting foot pressure. His weight goes from the outside of his back foot, inside front foot…then as his pelvis shifts forward, you’ll see his weight go to the inside of his back foot, outside of front foot. Also note, Pujols and Chamberlain ARE NOT ‘squishing the bug’ with their back foot, another thing purely rotational ‘hitting theorists’ cling to. You’ll see a little more linear elements to Ichiro’s swing (forward momentum and hand path), but he still starts sideways, and rotates, or turns, the center of his chest to impact. Did you catch the keywords “rotates” or “turns”?! Show me one hitter in the Big Leagues or Professional Fastpitch that ONLY have a linear swing…or ONLY have a rotational swing. I guarantee you won’t find ONE. At ANY level, I GUARANTEE you won’t find ONE baseball or softball hitter, PERIOD, that does either one or the other!! Are you getting the rotational linear hitting mechanics idea? I did this post titled Baseball Hitting Mechanics for Youth: Straight Landing Front Leg OR Bent? Benefit #6 in that post I sub-titled, “How Humans Change Direction & Planes of Motion”. Also, I included a YouTube video of NFL wide receivers running ‘Tree Routes’. A wide receiver running a cut route will use the 1) Front to back plane first, then when he makes his 90-degree cut, will momentarily move onto the 2) Side to side plane before getting back on and accelerating in the front to back plane. A hitter starts off moving on the 2) Side to side plane, but as they start turning get on the 3) Twisting plane. In order to understand rotational linear hitting mechanics clearly, we must consider putting aside our egos, and truly look at what’s going on in video analysis. Again, principles first, application second. Like few coaches that find me on social media…DO NOT fall into the same ‘willfully ignorant’ trap they do. If you AIN’T growing, then you’re DYING. There is almost always some form of linear (forward) movement that precedes the twisting. I call it getting a head start before making an explosive rotational move. Both Pujols, Chamberlain, and Ichiro do this. The path of the bowling bowling ball down the lane may be different, but ALL three stay within the ‘bowling bumpers’. Centripetal Forces are ‘center-seeking’ and Centrifugal Forces are ‘center-fleeing’. But clearly the swing is a combination of both…and then some! Linear AGAIN – after impact the hitter chases the ball with the barrel. The last part is crucial to consistency, and is a good example of Centrifugal Force. 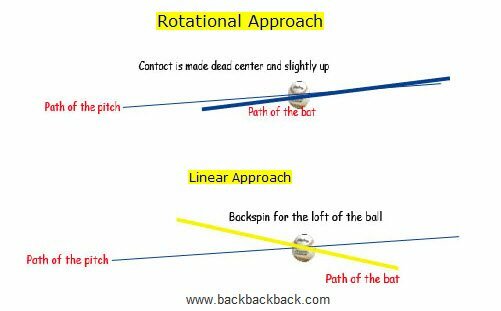 When talking about rotational linear hitting mechanics, I also give the swinging rock-on-a-string example in the main video above. You see, first the hitter uses Centripetal Force to turn the barrel into the zone sideways…the turn is meant to be quick and compact from an Angular Momentum standpoint (Keeping a slight bend in the front elbow, NOT from swinging down, being short, etc. ), until the barrel gets on the plane of the pitch. Elite hitters will keep their barrel chasing the ball after impact, until both arms get fully extended…whereby the barrel then circles around the body during follow through. So is it better to teach rotational liner hitting mechanics? As long as it’s a blend of the two. Let human movement principles be your guide. The path the bowling ball takes in the lane doesn’t matter, just as long as it stays between the bumpers. Great job once again. If my science teachers used baseball examples, I would have learned such topics better. Don’t forget the back foot skipping into contact as additional linear movement in the swing. Joe, me too!! And yes, good add with the back foot. We don’t find it ALWAYS skipping, but I like it to depending on the hitter’s timing mechanisms. Joe… right on… but here we go… It’s both linear and rotational, but what percentage is linear. I would say its way smaller than most think. While his belt buckle moves slightly forward, his head doesn’t. He might not even be moving his center of mass forward al all…even though his belt buckle moves slightly forward. Since the bat being swung top speed in front of home plate, that mass of the bats centrifugal force must be balanced in the opposite direction which is in back of Bonds towards the catcher… it has to be opposite direction of where the bat is moving. 2. waiting till front foot lands or reacting to front foot landing as key to start rotating. How many hitters keep their head in the same spot the whole swing…. Bonds did. I’m gonna say that Bonds was the poster child for not moving forward. His forward movement of his spine, like Pujols, was so minimal. They moved their front hips backwards keeping the spine in one location better than almost all MLB hitters. Totally Kyle! That’s why I like talking to you…you ask questions. My thoughts on Bonds and Pujols, even though Pujols has moved to a traditional stride over the past couple years, is they have massive bodies. In other words, they may be the exception to the rule. However, what both are doing (like golfers) is using a shifting foot pressure. …very insightful as it relates to hitters. Right, it is difficult to skip the back foot on the low pitch. Love your stuff and agree you with science on the two motions being used in the baseball swing. I do have to disagree being a former PGA golf professional that golfers swing down the target line with the golf club for a long distance. Being a very rotational movement from a bent over position with a bent stick the club only travels down the target for a very short distance. It approaches the ball from the inside contacts the ball and moves back to the inside. Which make me ask why do coaches tell batters to extend your arms after contact this should be a reaction to what happened before contact not a contrived motion? I stand corrected on golf Scott 🙂 And I agree, getting both arms extended post impact should be a natural reaction, but a lot of hitters are taught to stay bent with their arms, and/or their swing is more pull than push with the top hand. Both golf and baseball are driven by the push of the top hand, NOT the pull of the bottom hand. It’s more effective to push someone away from our center line, than to pull someone across our center line. Note: if you are connected to all your lines what does that mean to you… To me… That’s the preamble….If your not connected to all your lines… Fix that first… You better not power lift or swing a bat… Or do anything…. Get connected!!! Than and only than, use your hands and feet and meet in the middle…. ? I love your fascia, timing and your implementation teachings and drills… By far the best out there!!!! Question? Your going backwards and looking into the physics? Think… Load and unload… Think… Neutral to finish (and hold) to normal (any particular stance) to load and then when it’s time hit the mouse trap ( see ball hit ball)…. Sorry… I meant… Quads/hammies are the push and pulls… So obviously the arms have the same…. And the fingers/palms/wrist and toes/heel/ankle have the same thing going on….? I guess I’m losing you or you don’t agree… No worries!!! You see what where I’m going… And I had terrible posture so I saw and felt it to the point it’s undeniable…And the best thing was I didn’t even know it until I really looked into it…I actually thought I had pretty good posture and it wasn’t that big of a deal… That’s it!!!! That affected my reflexes and so much more… My breathing…. Etc…. Not to go into it but it’s always right in front of you and once you see it… It’s like… Seriously.. That’s it… By the way I wouldn’t only focused on the X pattern… I’ll look at the X with bottom 3 of both hands and top 3… What “top 3” … Kind of… With the same side foot…. Also when I balanced myself which sounds weird but I hope you see what I’m saying… I used my hands and feet to push through… Or else it would have taken forever to Let my “body” do it…Also I noticed my neck was really involved more than I would have guess… Meaning… It could really be hard to have two people have the same reflexes… Hard to say how substantial it would be but I guess if you get my premise… You are in neutral… Perfect posture… Than you use your hands and feet to set… Than you push through with your core…. And the premise is you use your core… But that should be realized as we should be using our core to start… For most off our movements and yes even daily movements… Getting up… Typing… Opening doors…. Etc…One thing I don’t understand is the stride.. Some say… Don’t step like your walking… Well…question??? How do you walk… Because I walk with my core…. My son drops his hands early and swings less rotational. He gets bat in a longer horizontal plane. He hit .436 in JV Baseball and .315 in Babe Ruth. I don’t like the swing and he wants to get better. Would a sling device making him swing more rotational be of greater assistance in your mind.